The 3pc Anchors Away Full/Queen bedding collection by Sweet Jojo Designs will creates a clean and classic look for your bedroom. It uses crisp white cotton, navy blue accent trims, and features traditional anchor appliques. 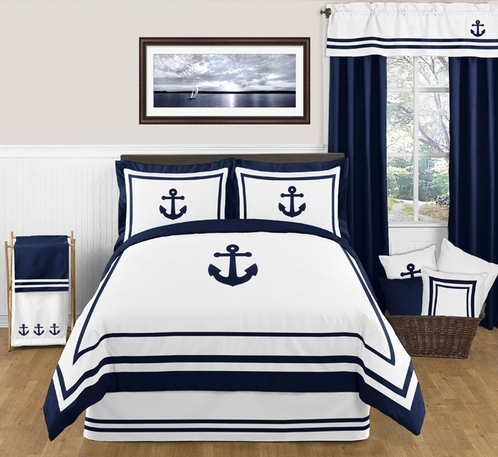 This Hotel inspired nautical themed designer bedding will set your bedroom up in high style. This Sweet Jojo Designs set is machine washable for easy care and repeated use. The comforter is designed with white cotton and navy accent trims. It is adorned with a large anchor applique. The matching pillow shams are designed using white cotton, navy trims and anchor appliques in the center.